A mother's love letter to her sonfeaturing over sixty gluten-, dairy-, soy-, casein-, and nut-free recipes. A portion of proceeds from the sale of this book will be donated to autism research. This heartfelt cookbook tells the story of a mother desperate to heal and connect with her hard-to-reach, severely autistic son, Leo, through the most vital everyday activitycooking. For many years, Erica Daniels had been out to find a successful dietary intervention for eleven-year-old Leo, who suffers from significant food allergies, gastrointestinal disease and autism. Through trial and error in her own kitchen, she finally hit her gastronomic stride of preparing nourishing meals for her entire family without gluten, dairy, soy, nuts, additives, or GMOSwith Leo by her side.  YouTube Organic Gummy Candies, and more! Learn not only to cook nutritiously for your whole family, but also to connect with your children, find their gifts and develop their strengths, impart life skills, and tie the family together with healthy food and happy guts. "You are the great love of my life, Leo Thomas Vernacchio. Raising you is a painstakingly beautiful journey of love. Letting go of my hopes and dreams for you is undeniably hard and my heart will always be a bit broken. Yet, I am eternally grateful for you and for the gifts you have blessed upon my heart, my life, and my soul. You give me purpose and passion, perspective and hope. You are my perfectly imperfect gift." "Helpful hints and humorous bits, Cooking with Leo is not your usual cookbook fare. Parents of children with allergy and food issues, who struggle with the alphabet soup of diets (GFCF, SCD, GAPS, etc. ), will find healthful food they can make for the whole family. Along the way Erica sprinkles tips for involving the kids and garnishes with a pinch of wit!" "No matter what the diagnosis, food is foundational to healing. While there are many amazing healing therapies and approaches for children on the autism spectrum, none will be as powerful or impactful if good nutrition is not also a part of the healing plan. 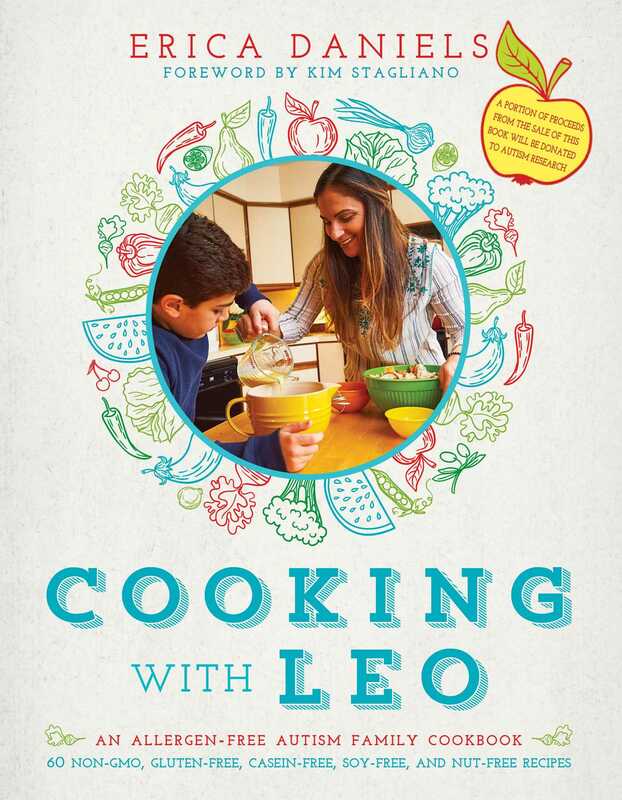 For those who do not know much about nutrition or who never learned how to really cook, Cooking with Leo makes cooking nutritious and allergy-friendly food with your kids easy and fun. Erica Daniels reframes the notion of special diets” by just calling them healthy diets,” an important distinction that reminds us everyone should be eating this way! Transforming your way of cook and eating will not only improve the health and symptoms of your child with autism, but the health of your entire family. For any family with a child on the autism spectrum, Cooking with Leo is square one. A perfect, nourishing, love-filled way to support the health and development of your child."